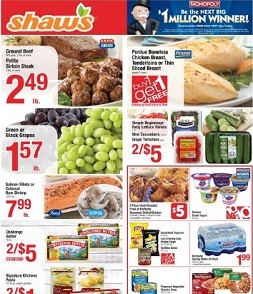 Latest savings from Shaws valid 2/23 – 3/1/2018: $2.49 lb U.S.D.A. Choice Ground Beef 80% lean, 3 lbs. or more Petite Sirloin Steak 3 lbs. or more; $1.57 lb Green or Black Grapes; B1G1 free Perdue Boneless Chicken Breast, Tenderloins or Thin Sliced Breast; 2/$5 Simple Beginnings Baby Lettuce Blends; 2/$5 Challenge Butter; 10/$10 Dannon Greek Yogurt; 2/$1 Signature Kitchens Pasta; 10/$10 Progresso Vegetable Classics Soup; 3/$10 General Mills Large Box Cereals; $6.99 Maxwell House Coffee; $1.99 Philadelphia Cream Cheese; $1.99 Keebler Sandwich Crackers; $.99 Signature Kitchens Apple Juice; $2.49 Planters Peanuts; $3.49 Heinz Ketchup; $3.49 Kraft Macaroni & Cheese 4 Pack Cups; $2.99 Kraft Deluxe Macaroni & Cheese; $1.49 Oscar Mayer Meat Wieners; $1.49 Breakstone’s Sour Cream; $6.99 Planters Pistachios; and more.